After two years of renovations and a complete transformation, California State University, Northridge’s Delmar T. Oviatt Library Special Collections and Archives is poised for a grand reopening. To celebrate the expansion and honor Jack and Florence Ferman’s generous $2.5 million bequest, the CSUN community is invited to attend the reopening reception on Thursday, Jan. 18, 2018 from 5:30 to 7:30 p.m. at the library. Outside of Special Collections and Archives Reading Room. Photo courtesy of Delmar T. Oviatt Library. 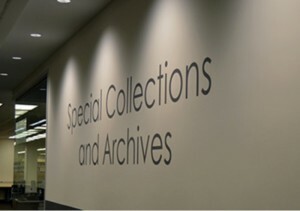 Located on the Oviatt Library’s second floor, Special Collections and Archives houses 50,000 cataloged items, including rare books, art, manuscripts and archives, historical and important periodicals, photographs, audio and video recordings, prints, and maps. Many of these rare and valuable materials are housed in the department’s new temperature and humidity controlled high-density storage facility. Among the materials are six major collections: The University Archives, the Urban Archives Collections, Special Collections, the International Guitar Research Archives (IGRA), the Old China Hands Archives, and the Tom and Ethel Bradley Center Collections. 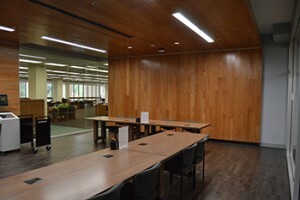 The expansion and remodel includes a warm and welcoming wood-paneled Reading Room with floor-to-ceiling glass windows, a service desk and a complimentary copy machine. The Reading Room offers abundant seating and multiple areas for students, faculty, staff and visiting scholars to engage in research. The newly redesigned Reading Room in Special Collections & Archives offers a quiet research space in a beautiful wood-paneled room. Photo courtesy of Delmar T. Oviatt Library. Conserving historical materials is a craft which was very familiar to the Fermans, who were long-time friends of the Oviatt library. Jack Ferman was a businessman, and Florence Ferman was an artist and a CSUN alumna. Philanthropists at heart, the Fermans left behind a transformative gift that will continue to impact the lives of students and generations to come. The grand reopening reception will include IGRA student guitarists, complimentary appetizers and special remarks by Library Dean Mark Stover and professors Steven Thachuk and Heidi Schumacher. Please RSVP by January 11, 2018 to reserve a seat. Persons with disabilities may email library.event@csun.edu or call 818-677-2638 in advance to arrange accommodations. For directions and parking details please visit http://www.csun.edu/parking/visitor-parking-information.